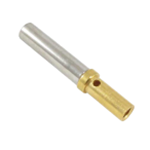 These are an environmentally-sealed connector designed specifically for cable to cable applications on the engine or transmission, under the hood, on the chassis or in the cab. 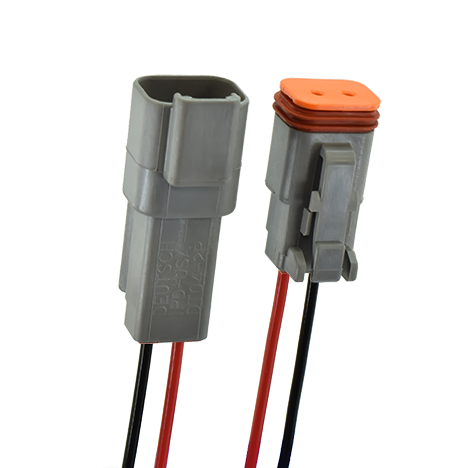 On signal level circuits in harsh environmental conditions, where even a small degradation in connection may be critical, the Deutsch DT Series general purpose connectors will provide the reliability and performance at the lowest cost. There are many configurations of Deutsch DT Series connectors. This guide covers the commonly used connectors and their specifications. Each Pin and Socket has multiple variations for wire size. Insulation resistance: 1000 megohms minimum at 25°C. Vibration rating: No unlocking or unmating and exhibits no mechanical or physical damage after sinusoidal vibration levels of 20 G’s at 10 to 2000 Hz in each of the three mutually perpendicular planes. No electrical discontinuities longer than 1 microsecond. Dielectric withstanding voltage: Current leakage less than 2 milliamps at 1500 volts AC. Fluid resistance: Connectors show no damage when exposed to most fluids used in industrial applications. Moisture resistance: Properly wired and mated connections will withstand immersion under three feet of water without loss of electronic qualities or leakage. Thermal cycle specifications: No cracking, chipping or leaking after 20 test cycles from -55°C to +125°C. 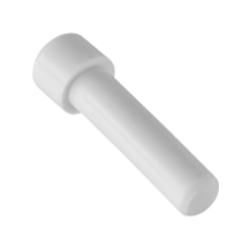 Sheel Material: DT connector shells are made of rugged glass filled PA.
Grommets material: DT connector grommets are made of silicone rubber. 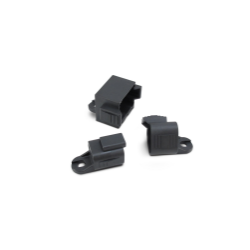 Wedgelocks materials: DT connector wedgelocks are made of rugged glass filled PBT. Receptacle interfacial seals materials: The DT connector receptacle interfacial seals are made of silicone rubber. 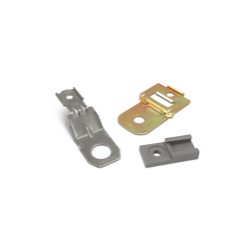 Several accessory items are available to complement the connectors including boots, backshells, dust caps, and mounting clips. Accessory items cover a wide array of design requirements such as assisting with mounting, providing additional protection, and offering enhanced aesthetics.